Noble metal nanostructures have demonstrated a number of intriguing features for both medicine and catalysis. However, accumulation issues have prevented their clinical translation, while their use in catalysis has shown serious efficiency and stability hurdles. In the paper by Domenico Cassano (PhD student at NEST-SNS), Jeremy David (IIT@NEST), Stefano Luin (NEST-SNS), coordinated by Valerio Voliani (IIT@NEST) and published on Scientific Reports journal, a simple and robust synthetic protocol for passion fruit-like nano-architectures is introduced. 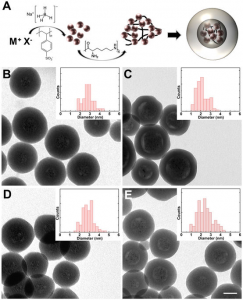 This new kind of nanoparticle is composed by a silica shell embedding polymeric arrays of ultrasmall noble metal nanoparticles. These nano-architectures show interesting features for both oncology and catalysis. They avoid the issue of persistence in organism thanks to their fast biodegradation in renal clearable building blocks. Furthermore, their calcination results in yolk-shell structures composed by naked metal or alloy nanospheres shielded from aggregation by a silica shell.